Thank you for your touching and edifying homage to Chula Clausi. 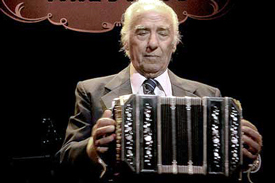 With your permission, I would like to add a link to an interesting documentary film about bandoneonistas and the bandoneon (El Ultimo Bandoneon), in which Chula Clausi makes a cameo appearance. Thank you. Your words were beautiful, It is very true, He played with his heart.